Holocaust films are a historically tricky business. It’s inherently difficult to capture the event’s unspeakable horror without devolving into exploitation or making its depiction dramatic, i.e. simply showing despair isn’t the same thing as narrativizing it. However, László Nemes’ debut feature “Son of Saul” lives in the despair of the Auschwitz-Birkenau camp by demanding that the horror is always present. Shot almost entirely in shallow focus, “Son of Saul” keeps its title character, a Hungarian member of the Sonderkommando forced to aid with the disposal of gas chamber victims, in the foreground as the atrocities surround him out of focus in the corner of the frame. This technique isn’t exclusively meant to spare the audience of full immersion, but it’s mostly meant to normalize the horror for Saul (Géza Röhrig) who is on a mission to give a proper Jewish burial to a dead teenager that he believes is his son. Winner of the Grand Prix at the Cannes Film Festival, “Son of Saul” has garnered rave reviews for its harrowing, thrilling depiction of sacrifice and the discovery of purpose while facing certain death. It’s been roundly considered one of the very best films of the year. “Son of Saul” is an immersive experience of the most disturbing kind, an unwavering vision of a particular kind of hell. No matter how many Holocaust films you’ve seen, you’ve not seen one like this. A confident, audacious first feature by Hungarian director László Nemes and winner of the Grand Jury Prize at Cannes, “Son of Saul” is carefully focused on a 36-hour period inside Auschwitz-Birkenau in October 1944. It’s not just the film’s complete avoidance of special pleading and sentimentality, nor the concentration camp setting that makes “Son of Saul” simultaneously difficult to watch and impossible to turn away from. It’s the powerful and impressive way director Nemes, his virtuoso cinematographer, Mátyás Erdély, and the rest of the team combine aesthetic choices and cinematic techniques to give viewers a terrifying fictional glimpse of what it might have been like to be inside what Nemes has called “a factory producing and eliminating corpses on an industrial scale.” This glimpse is so potent and unprecedented that it overshadows the story of one man’s quest that Nemes and his co-screenwriter, Clara Royer, have chosen to tell. To a certain extent that narrative functions as a device that enables us to see more of the charnel house chaos of Auschwitz-Birkenau (where part of Nemes’ family was killed) than we would otherwise encounter, a skeleton key, in effect, to different circles of hell. Read more. What are the limits of representation? That’s a moral question that hovers over any depiction of the Final Solution, and it’s not considered lightly by László Nemes’s “Son of Saul,” which turns unimaginable horrors into tangible ones. By venturing inside the death factory of Auschwitz-Birkenau, Nemes risks greeting obscenity with obscenity, as if the Holocaust were the latest frontier in you-are-there experiential cinema. Whether Nemes crosses the line is a matter of personal taste, but there’s no question that he’s aware of that line, because nearly every second in “Son of Saul” feels like an act of aesthetic calculation. What we see and don’t see, what we hear and don’t hear — all rigorously determined to evoke a historical evil as fully as possible without marinating in it. Though Nemes and his cinematographer, Mátyás Erdély, are precise in controlling what the camera glimpses, their main strategy is to limit visual perspective severely and leave the soundtrack — and the viewer’s imagination — to do most of the dirty work. In his audacious feature debut, Nemes, a Hungarian who served as assistant director to Béla Tarr on “The Man From London,” narrows the frame to Academy ratio, keeps a shallow depth-of-field, and tracks a single cog in the death-camp machine. There’s a creeping sense, throughout the film, that any attempt to open the lens a little wider or follow a more redemptive arc would be an unseemly act of exploitation. Read more. “Son Of Saul” is the rare Holocaust drama that finds actual drama, and not just despair, in the living hell of a concentration camp. It’s hinted early on that Saul may be wrong about the boy, that he may have invented the blood relation in his mind. Whether the child is his or not is irrelevant; the film is more interested in providing actual agency to a man stripped of everything, to giving him an honest-to-God choice. It’s all related to the moral dilemma of his moral mission: As it eventually becomes clear, Saul is part of something larger than himself, a resistance movement among the Sonderkommandos, who are plotting an escape. By choosing to privilege his newfound crusade over his role in the plan, is Saul choosing self-interest — some form of fulfillment before he dies — over the potential survival of the group? (“You failed the living for the dead,” someone eventually tells him.) If “Son Of Saul,” with its elaborate handheld following shots, sometimes resembles an especially ambitious and robust Dardenne imitation, it’s also the rare film that feels indebted not just to those sibling directors’ style but also to their profound ethical and spiritual inquiry. Read more. Right away, we know we’re in the hands of a director who wants to tell the story of the Holocaust from a different perspective than we’ve seen before in films: a more personal, intimate one. “Son of Saul” is a movie that requires attention and patience, with a script from Nemes and Clara Royer that’s often wordless or whispered. If you’re not a fan of ambiguity, either from a narrative or moral perspective, you may have trouble here. But this is just a marvel of controlled filmmaking — a bold vision carried out with powerful simplicity, and an impressively assured debut form both Nemes and Röhrig as his star. Röhrig has the tricky task of carrying this story on his shoulders — and us along with him — without the benefit of being able to emote or even say much. It’s a physical performance as much as it is a quietly emotional one; he has to establish who this man is mainly through his gestures, demeanor and energy. Saul is savvy and resourceful, traits he must use again and again to survive over the course of a harrowing couple of days. Then again, time is hazy here, as are many elements of “Son of Saul.” Identities are unclear at times, even of characters who play pivotal roles. Maybe that’s intentional, though — an effort by Nemes to suggest the psychological chaos that can exist in such a cruelly systematic environment. Read more. But of course, everything I have said about this movie so far has to do with its formal strategies and visual tactics. To say that “Son of Saul” is a highly stylized, self-conscious and calculating piece of narrative is not to say that it’s a bad movie, only that it’s a movie. And to say it’s a Holocaust movie is not so much to identify its subject matter as to specify its genre. Mr. Nemes may disdain “Schindler’s List” — as every ambitious European art-film director must — but he is very much in its debt. In the immediate aftermath of World War II, the mass murder of the Jews seemed to many artists and intellectuals to exist beyond the reach of representation. It was something to be handled with the utmost care and gravity. But art, especially popular art, abhors a vacuum, and the Shoah is, among other things, a rich reservoir of stories, true and speculative. There are works of narrative — like Claude Lanzmann’s “Shoah” or the novels of Patrick Modiano — that try to measure the gulf between past and present and to document the inadequacy of memory. There are others that try to bridge that gap by recreating or retrieving a sense of what actually happened. “Schindler’s List” remains the best-known — and one of the best examples. And there are some that try to fill the void with fable and fantasy, like “Inglourious Basterds” and “Life Is Beautiful.” “Son of Saul” belongs more in the third category than the second. It’s a beat-the-clock thriller wrapped around an allegory. Saul witnesses the death of a boy who may or may not be his son, and becomes obsessed with giving the body a proper Jewish burial. He scrambles through the camp, a buzzing hive of hideous and mundane routines, in search of a rabbi. He barters and begs, and his quixotic project intersects with desperate plans for rebellion and escape that other prisoners are hatching. Mr. Nemes orchestrates a tour de force of suspense, a swift symphony of collisions, coincidences and reversals that is almost unbearably exciting. His skill is undeniable, but also troubling. The movie offers less insight than sensation, an emotional experience that sits too comfortably within the norms of entertainment. This is not entirely the director’s fault. The Holocaust, once forbidden territory, is now safe and familiar ground. Read more. Rohrig’s slender, bewildered appearance at times lends a robotic feel to the character, whose lack of a cogent backstory sometimes hinders the ability to fully invest in the stakes of his goal. Still, Nemes drops plenty of hints along the way, and the rapid pace smooths over some of the outstanding questions surrounding his motives. From start to finish, Saul never takes a break for the sake of exposition. The uneasiness carries over from scene to scene. One heartbreaking sequence in which he briefly makes contact with his wife in the neighboring women’s section of the camp results in a painful confrontation between the estranged couple that — due to the limiting environment — unfolds exclusively through eye contact. 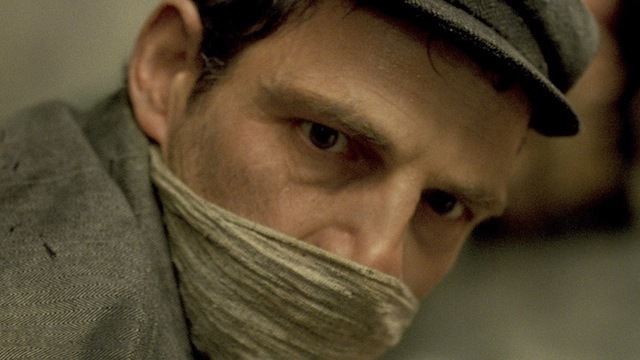 By extension, “Son of Saul” avoids any extensive interruption to explain the stakes at hand, but the visceral quality of the proceedings say enough. When one prisoner notices Saul’s endeavor, he advises, “a rabbi won’t save you from fear.” Read more.